Is it time for Apple to Enter the Automotive Industry? In early 2011 I posted a blog entry discussing why I thought Apple and Tesla Motors should try and form a partnership to exploit the growing interest in electric vehicles. The blog was recently picked up by a student at the University of Florida who asked me to provide some more thoughts on this idea. I also saw a comment posted to my original blog which said that he had conducted a random search in Google for Apple and Tesla and he stumbled across my blog entry. So I guess it goes to show that I am not the only one to think that this could potentially be an interesting partnership, if not a game changer in terms of how the automotive and high tech industry works more closely together on developing new products. In fact the convergence of the automotive and high tech industries over the past 18 months or so is one of the reasons that I came up with the original idea of Apple and Tesla potentially working together. Now since that earlier blog entry, which I posted in February 2011, there have been a number of developments in the electric vehicle market. In March 2011, Nissan finally launched their Leaf vehicle in the UK, the Chevrolet Volt launched in the US and is due to launch in the UK in 2012. BetterPlace (discussed in an earlier blog post) has been expanding their charging infrastructure and here in the UK another company called Chargemaster launched another privately owned charging infrastructure called Polar back in July. Sales of Nissan’s Leaf vehicle have been rather slow to say the least, especially with consumers still fighting against range anxiety, ie worrying about what happens if their battery becomes depleted whilst out driving their cars. So I think the industry still has some work to do to boost consumer confidence, produce desirable electric cars and provide a charging infrastructure that can, for the moment at least be rolled out across major cities. I took a look at charging infrastructures in an earlier blog entry. So what can the industry do to increase consumer confidence about purchasing an electric vehicle?, step forward Apple! I have been following Apple since I was at University and a few years ago I spent many hours completing an assignment about the growth of Apple as part of my MBA course. They have diversified their business on countless occasions and the latest rumour to hit the streets is that they are planning to enter the domestic TV market by making their own TVs. 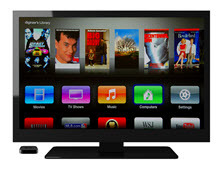 Many internet enabled TVs have recently been launched, for example Samsung’s D series, with apps that can download your favourite social media content and this of course plays right into Apple’s market as they initially introduced the concept of downloadable apps. Many TVs are now being launched with WiFi connectivity and many see the TV becoming the social media hub of tomorrow’s homes. Apple wants to be part of this. But what happens when consumers go out of their home? Firstly, if Apple was to undertake such a project then it would really be as a joint venture rather than an acquisition of a company such as Tesla. Apple has a valuable brand to protect and if anything went wrong with a potential joint venture that reflected negatively on Apple then they could just walk away. Apple could easily afford to buy Tesla if they wanted to (as I alluded to in my earlier post), but even though Apple has the most efficient supply chain in the world, and they have a number of ways to protect their intellectual property, they do not have any experience of building cars. Apple products have been popular amongst consumers due to their slick user interface and the simple nature of how their products operate. Cars on the other hand have relatively complex interiors so imagine what could happen if Apple applied their magic to designing a much simplified car infotainment system. 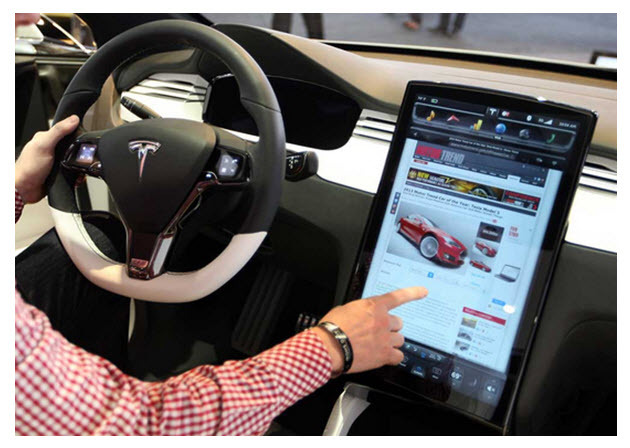 In fact Tesla’ new car, the Model S, has a 17inch touch screen on the centre console and this is context sensitive to allow the screen to control different aspects of the car’s interior. For example the lighting, heating and entertainment systems can all be controlled through the touch screen interface. Nissan’s Leaf allows you to remotely monitor the charging of your car’s battery via an iPhone app and also allows you to switch on the car’s heating system remotely before you even get near the car. Again, this shows how pervasive the iPhone has become, its ability to control anything, via a 3G or WiFi connection. Next to a house, the car is the second most expensive purchase we are likely to make in our lives. Apple has done well to corner the consumer electronics market and I just think an Apple/Tesla JV would be a match made in heaven so to speak. Imagine what Tesla would be able to do with the financial clout of Apple behind them. The introduction of WiFi hotspots in some cars has led to some companies such as Toyota looking to introduce social networking capabilities within their car’s infotainment system. Earlier this year Toyota announced a partnership with salesforce.com to embed their ‘chatter’ social networking tool into Toyota’s Entune system. If WiFi does go mobile extensively in cars you can guarantee that Apple will want a piece of the action. If Apple were serious about entering the automotive market, and I am not implying via this blog that they are, then if they were looking for maximum return, scalability of the business and quick adoption levels then perhaps licensing their iOS environment would be a good move. Apple is famous for two things, firstly, first mover advantage, just look at the market share that they have captured by releasing the iPad 12 months before their nearest competitor. Secondly, no other company manages to instil such confidence in their products, so if the main barrier to electric vehicle adoption by the masses is range anxiety etc then why not let Apple run their magic over the electric vehicle industry. Shortly after I posted my earlier blog, BMW announced their range of iSeries cars, effectively brand new electric vehicles that will be brought to market over the next few years. I wonder if BMW’s product management team have knocked on the doors of Apple’s HQ? BMW’s new range of electric cars were displayed at the Los Angeles motorshow in 2011, the first time they had been seen in North America. (BMW launched their i3 and i8 electric vehicles in early 2014). This video nicely demonstrates why BMW is trying to increase their presence in the EV market ! GM, Ford, BMW and others are you listening!, there is a great opportunity here, if Apple does not partner with Tesla then I wonder who Apple will partner with? If and when Apple does decide to enter the automotive market then whoever they partner with stands to gain a significant share of the electric vehicle market.2011 was certainly a turning point for both the consumer and the enterprise computing markets and tablet device and cloud computing has significantly impacted both of these sectors. Apple has certainly been in the right place at the right time to capitalize on these trends, the big question is will they look to exploit their extensive skills and knowledge in these areas by entering the automotive sector? If Apple partnered with a car manufacturer, would you buy their joint car based on the strength of the Apple brand? If one car had iOS as the basis of its in-car entertainment system and it allowed you to seamlessly connect your other Apple devices and connect to iCloud, would you buy this car over one that didn’t run iOS? In closing, I think it is somewhat ironic that Steve Jobs rescued Pixar from George Lucas in 1996 and the company then went on to develop two of the most successful animations of all time, Car ! After the company was sold to Disney in 2006, Steve Jobs was given a 7% stake in Disney and a seat on their board. 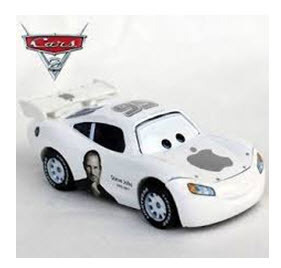 Perhaps the Car film franchise was a subliminal message that one day Steve Jobs wanted to take Apple into the automotive industry !